The controversy over the Central Access Scheme (CAS) in Kilkenny city has raised some important issues about local democracy in Ireland. One of these concerns the link between elected representatives and citizens. On the one hand those who, for different reasons oppose the scheme, claim that democracy is dead. Councilors do not represent the voices of all the people and so the system has failed. On the other hand, supporters of the scheme state that a vote on the matter in Council has been carried on numerous occasions and passed with a significant majority. Therefore the voice of the people has been heard. The first of these perspectives is about voice; the second, about official electoral systems and voting. Until recent times these were considered linked, but today a relationship between voice and vote is not so obvious. Party membership has declined and continues to decline. In 2008 only 63, 000 people or 2% of the Irish population were members of a political party (Biezen et al., 2009). Parties across Europe have also gradually moved away from civil society and towards the state. Given these trends, how do multiple voices in a community get represented? Taking an optimistic stance, we may assume that given the huge amount of opinion flowing around the media, social media and consultations that representatives have plenty of opportunity for representing the views of citizens. But how do we know if ‘representation’ is happening? If fewer people are members of parties then there is no guarantee that the party position on an issue (where it exists) will adequately reflect a citizen’s view. In fact, while there are ample measures and statistics for how the electoral and voting system operates, there are few ways to know how the multiple voices of a community on any issue have been represented. Let’s take the CAS, for example. On this issue, a study by CiviQ.eu (CiviQ, 2014) found four distinct broad perspectives: an Economic perspective promoting the benefit of the CAS to Kilkenny in terms of access, jobs and employment; Sustainable Transport that argues for policies that discourage traffic from the centre and supports a healthier environment; Complete the Ring Road which focuses on retaining the heritage, medieval structure and character of Kilkenny; and Improve the Democratic System. The first three of these were included in public submissions to An Board Pleanala and oral hearings (2008). The last emerged as the process unfolded. Any process for examining how these four perspectives were represented faces a number of challenges. First, as is the case across Councils in Ireland (with the exception of some including Fingal, Dublin City and Dun Laoghaire Rathdown County Councils), there is no audio or written transcript of the complete proceedings of Council meetings. 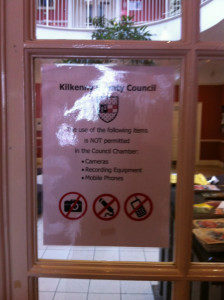 As in the case of Kilkenny County Council, mobile phones, recording devices and cameras are prohibited in the Council chamber. Therefore, it is not physically possible for the full public to be aware of how views are being represented during Council sessions. Second, the written record – minutes – are summaries of meetings focusing on decisions. They do not include the detail required to understand which, if and how opinions were stated and how they were debated. They are also stored in static documents making it difficult to follow how issues were discussed across time. Third, written submissions to An Bord Pleanála on the CAS were private until after the consultation was closed. To view those submissions it is necessary to visit An Bord Pleanála or Kilkenny County Council where they are stored in paper format. Closed submissions remain the norm for nearly all public consultations across the country. The problem is that little dialogue therefore can occur during the consultation process on the information and views contained in these submissions. Once they are published, and the information is shared, the consultation is already closed. In sum, voting systems (either in choosing representatives or in making decisions in Council chambers) are no guarantee by itself that we have a democracy. What also matters is that 1) all views are being represented and 2) that there is a way for deliberating that is inclusive, transparent and fair. In this sense, there is an urgent need for change both to process and how we think about democracy. Is it enough to say that the democratic process has worked because votes were taken? What type of voting – majoritarian, multi-optional, etc. best represents democracy? Or is it equally important to ask when does voting occur – after how much deliberation among people representing a fully inclusive range of views on the issue? In the case of the four perspectives identified above on the CAS scheme, the economic perspective (in favour of the scheme) was the one most consistently represented by the majority of Councillors. Only one Councillor before the 2014 local elections, represented the three alternative perspectives over the full lifetime of the process – perspectives against the scheme. The CAS, now in construction, brought thousands of citizens to the streets in protest in 2014. It thus presents an ideal opportunity to reflect on deepening democratic processes at the local government level in terms of the relationship between voice and vote. It seems clear, that while there are many ongoing efforts to reform local government and its responsiveness to citizens, an essential first step to strengthening local democracy is to fully open information and communication flows generated during public consultations and Council meetings. This means at a very minimum removing the ban on mobile phones from Council meetings and facilitating open submissions during consultation periods. Biezen, I. V., Mair, P., & Poguntke, T. (2009). Going, Going,… Gone? Party Membership in the 21st Century. ECPR Joint Sessions, Lisbon, April.